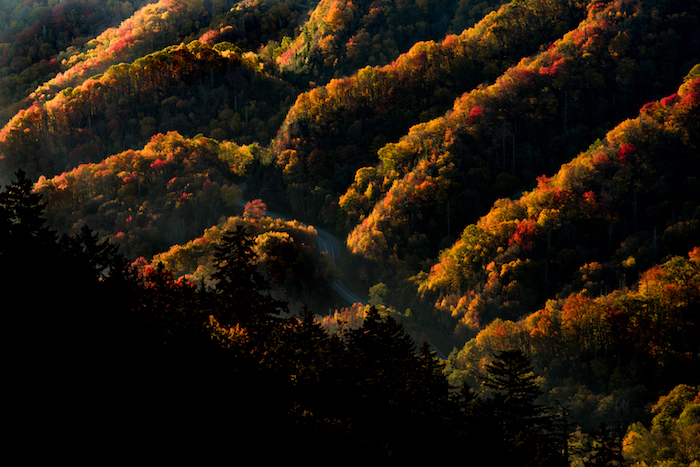 October is a magical time to travel to Townsend Tennessee, a gateway to the Great Smoky Mountain National Park. Happily, this year the leafs decided to change colors literally as I was pulling into town.Lucky break! I had the opportunity to combine photography with exceptional road biking. My typical day consisted of a morning shoot around 6am as first slight spilled over the mountains. The image below was captured on the Foothills Parkway 20 minutes before the sun made it’s appearance. Once the sun emerged, it was time to re-group and start riding up the 2,500 ft. elevation gain to the summit of the parkway. Oh my burning legs! Over the next few days when not on the bike, I had the chance to explore a myriad of uncrowded streams that traverse the National Park. The view below is just off a gravel road leading to the small town of Tremont. Seems like there’s a waterfall around every turn! Ok, now to photograph that scene behind me! One of the park’s main attractions is an area called Clingman’s Dome. The drive from town to this vista takes around 70 minutes. Lot’s of vistas emerge as you weave your way up the park road…showcasing the fall color change. The best view in the park has to be a sunset atop the Dome! The low lying clouds created the backdrop for the glowing rays of light to backlight the scene. Pretty special.